Instead of getting on a subway to Central Park before sunrise, I hopped on an airplane to Florida a day before the race. Instead of putting on my running shoes with which I have pounded hundreds of miles on the hard, NYC cement roads, I donned a pair of spikes to welcome the soft dirt paths and grass underneath my feet. 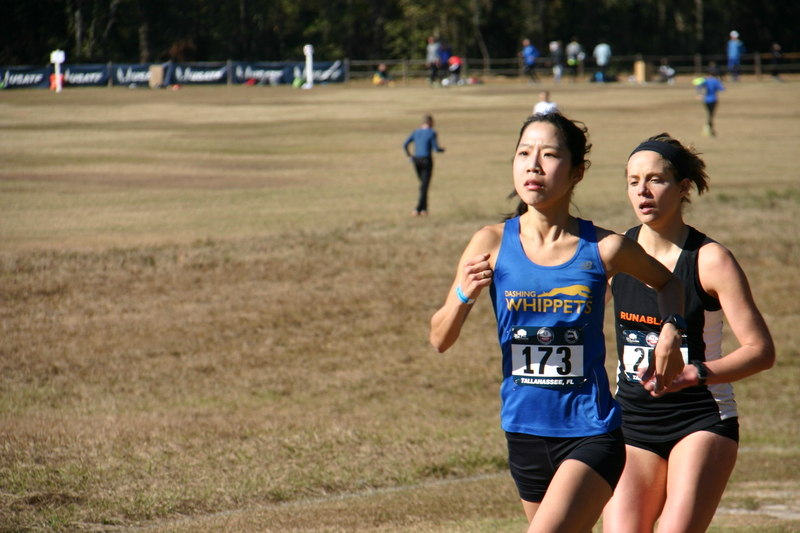 Instead of striving for an individual PR, I focused on how to race together as a team. And, instead of parting my own way home after the race, I regrouped with the rest of Dashing Whippets for a hearty meal followed by celebratory drinks until very late into the night (by a runner’s standard, that is). Needless to say, it was one of my favorites and by far the most memorable experiences to date. 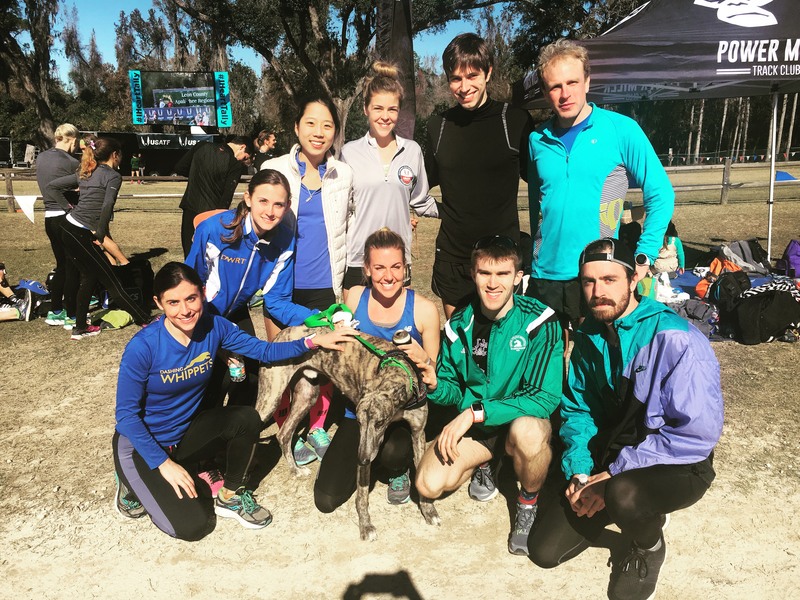 This year, 16 Whippets (Open Women, Open Men, and Masters Men) traveled to Tallahassee, Florida, to participate in the annual USATF National Club XC Championships. While I have not ran cross country since freshman year in high school, I was seeking some changes to my running routine after the NYC Marathon, so I decided to join the team. Also, how could I say “No” to escaping the frigid weather in NYC to race in Florida? The Whippets arrived around noon on Friday at Jacksonville Airport, where we were picked up by Coach Chris Forti in a giant, 15-people van we rented for the weekend. Most of us met for the first time, but the 2.5 hour drive to Tallahassee in our “family van” helped us to get to know each other better. We drove straight to the Apalachee Regional Park for a course preview before checking in at the hotel. Everyone was tired from all day of traveling, so we had a quick team dinner and headed to bed early for the big day tomorrow. On Saturday morning, we had “I’m-nervous-so-don’t-talk-to-me” breakfast at the hotel and headed out to the course. Because the start times for the Masters Men, Open Women, and Open Men were an hour apart, we were able to cheer for each other and take photos when we were not racing. The key differences between XC and road racing are the obvious physical differences, such as grass/dirt vs. cement and spikes vs. road shoes, as well as the more subtle strategic differences like focus on team vs. individual and overall placing vs. time. Around 10 minutes before the gun, the six ladies of Open Women Team – Emmi, Jessica, Brigette, Jessy, Cassie, and me – checked in together in our matching singlets. Chris met us in our box to share some last minute wisdom. He reminded us the field comprised of extremely fast women, majority of whom are professional runners, including Olympian Colleen Quigley. He advised us to not expend all our energy (a lesson I learned from the marathon!) in the first kilometer, and to try to keep pace with each other. I don’t normally get too nervous before longer road races since there is a wiggle room for mistakes, but I was definitely feeling jittery at the start line. I guess I wanted to run well to avoid letting my team down and perform well enough to justify having traveled all the way to Tallahassee for this 6K race. At the command signal, we stepped toward the line and the gun shot off shortly after. The first kilometer was mostly downhill so I had to make a conscious effort to ensure I was pacing smartly. I tried to run tangents and kept my eyes on the blue DWRT singlets ahead of me. The two loops of the course were relatively flat with rolling hills and a big incline at the end. I was huffing, puffing, and sniffling, and my chest had a burning sensation as the cold air went down my throat. However, seeing the Whippets men cheer for us at strategic locations throughout the course gave me boosts of energy. I finished the 6K race in 23:18 (6:15 pace). When I crossed the finish line, I saw ahead me a massive group of women who appeared to have finished the race some times ago, while behind me was a sparse field of just a few ladies finishing the race. Needlessly to say, running the Nationals was an extremely humbling experience and an eye opening exposure to the world of elite runners. 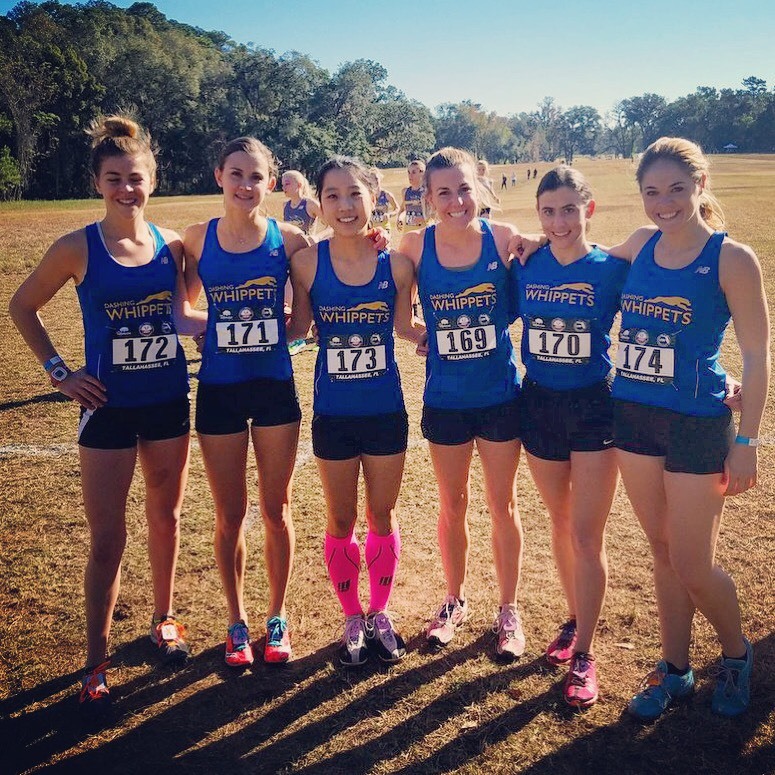 The majority of Whippets ladies were used to placing in Top 10 at most local NYRR races, but here at the Nationals, we gave ourselves a pat on the back for not placing last! With the running portion of the trip over, the Whippets bonded over hearty Mexican lunch, Christmas tree lighting in downtown Tallahassee, a bar crawl after party, and a live Prince cover band. 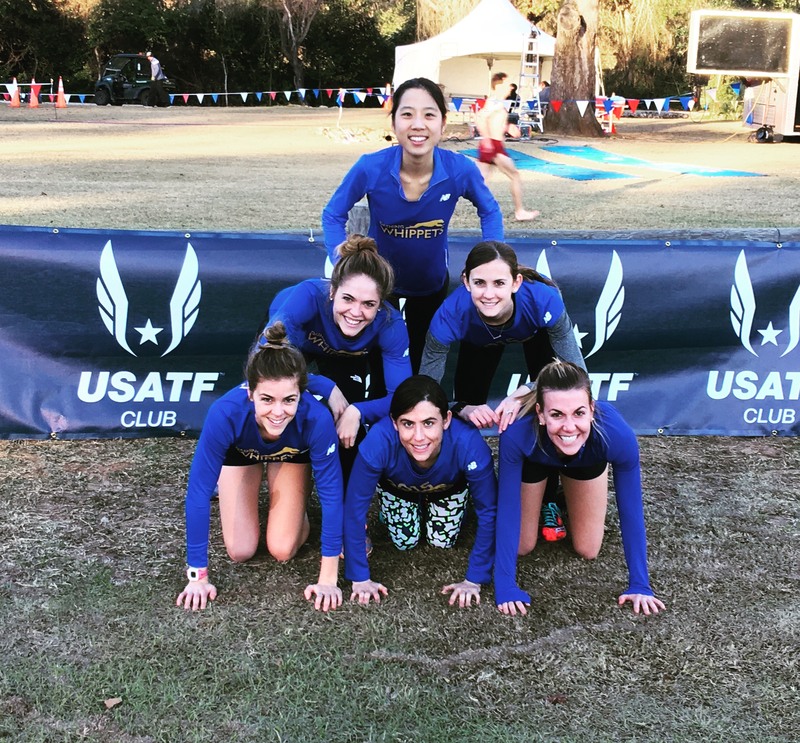 Since most of us don’t train together and only see each other couple times a year, I really enjoyed spending the weekend with my teammates while doing what we love the most – running (and drinking). As I wrap up my 2016 running season, I am already counting down the days until next year’s XC Nationals. Kentucky 2017, here we come!